I have always believed that if you expect more of people they will deliver it more often than not. I’m not talking about just expecting high results because I said so. I’m saying that I expect people to be better human beings, to take responsibility, to take ownership and to follow through on actions for everyone’s betterment and I’ll pay more for that expectation. 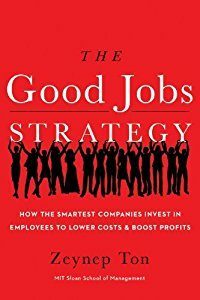 There are some great stories in these pages and some great examples of why paying people more and providing a fulfilling workplace are essential to long-term success. I think it’s easy to read a book like this and see these examples, agree with them and then go into the office and look at the bank account and make a decision that is the opposite of what we wish we could do. It takes courage to trust. It takes an immense amount of courage to trust others to do as you would, or better and to release them to your customers and each other without constant micromanagement. It’s a fear of loss that really holds back the owners and CEO’s of the companies that aren’t on board with Zeynep’s theories on employment. Owners fear losing control and losing money. Employers want to control behavior by controlling compensation and driving the right behaviors this way. Zeynep argues that behavior shouldn’t be controlled this way, it should be earned. The right behaviors will come automatically if you offer more than reasonable compensation and make clear requests on actions desired. It seems pretty simple actually. I listened to the audio version which was great. The narration at times did lag a little and I listened at 125% and sometimes 150% speed, but this is common for me. The stories in the book kept me interested and the ideas were laid out in such a way that they were reinforced enough without my having to take notes. This is rare for a book like this in my experience. I have often had to rewind or even buy the print version to fully integrate the ideas and messages from the book. In this case the audio provided clarity and kept my attention. I train and coach my sales people on a daily basis and I thought that this book may give me some quick and easy steps to invest in training and long-term success plans. It turns out that the book is about much more, but it does touch some on investing time, energy and resources into your people. I often find that I am hopelessly optimistic and I think that this book is too. Invest and believe that the investment will be returned to you. A few people may let you down, but more often than not you will see the results you desired and more. Don’t take my word for it, Zeynep has done the research and has the numbers to back up her ideas. For anyone who has influence via self-employment or management, this book could change the way you view the employer/employee relationship. Some employers believe that the obligation runs from the bottom up, meaning the baseline worker is obligated to deliver a certain production in return for pay. The mid-level managers have to deliver certain numbers to their boss in return for the education and for being supplied the leads, raw materials or marketing. The managers deliver to VPs and someone delivers the results to the owner who is owed for starting the entire operation in the first place. Zeynep says that this is upside down. The owner has an obligation to provide a safe work environment where everyone can earn a decent living and feel satisfied with their work. The owner is thankful that the VP’s, managers and baseline workers supply him/her with a great income and the opportunity to grow. It’s servant leadership by putting your money where your mouth is. I hope her ideas find their way into more and more company boardrooms and HR offices. Good read.